You Can Win the War Against Termites! Click here to open or download our .pdf Green Termite Bait Systems information brochure. Click here to download the 25.5MB .wmv movie file to see us on "Extra" as presented on Channel 9 - Brisbane. 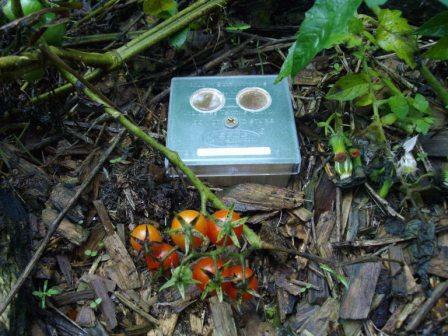 The Green Termite Bait System gives you a window into their underground world. You can see exactly when they arrive in the bait. It's then simply a matter of freshly adding a minuscule amount of termiticide (Termidor Dust ® recommended) to the bait. This procedure is usually done by your local pest control company. The termites unwittingly carry their lethal load back to the nest where it is distributed among all the termites (including the Queen) and within a few weeks the entire colony is wiped out. They simply don't have a chance. Your home is made safe. It's termites that have to worry now, not you. Before and after photos of a typical Green Termite Bait. Note the "activated and treated" bait on the right. Termiticide is easily added by your professional termite manager after the termites drop in for a feed. Beware of imitations... look for the Green Termite Bait Systems label on the top of the bait. 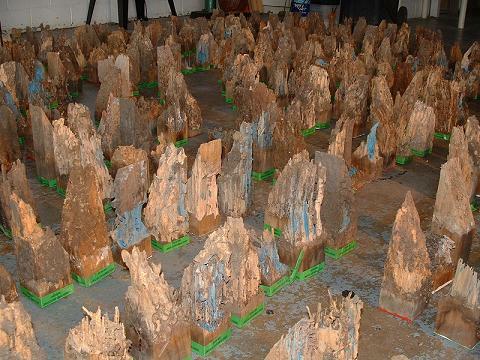 Since 1996 we have treated thousands of active baits, destroyed thousands of nests. Here are just a few in a "Termite City"
Easy to see and early alert of termites near your home. A strong chance to destroy their nest before they damage your home. The Green Termite Bait System has been tested and proven to work since 1996. Low cost and great value for money. 100% back-up and support if you need additional help. (See our testimonials). Peace of mind. Doing something proactive for added protection on your home. "Making the simple complicated is commonplace. Making the complicated simple, awesomely simple, that's creativity." - Charles Mingus, Legendary jazz musician. During the heat of the space race in the 1960s, the US National Aeronautics and Space Administration decided it needed a ballpoint pen to write in the zero gravity confines of its space capsules. After considerable research and development, the Astronaut Pen was developed at a cost of $US1 million. The pen worked and also enjoyed some modest success as a novelty item back here on earth. 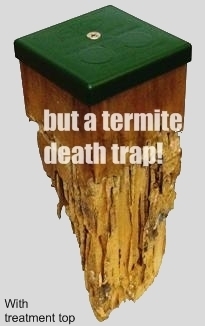 Likewise the Green Termite Bait System simply works! You'll love our user friendly Ec2c Termite Window. No guessing... ever! Simply see for yourself if there is termite activity any time you stroll past your baits. Mud in the window tells you the termites have arrived. An active bait clearly showing termite mudding. Easy to check at a glance. It's so easy to see if you've got the little blighters! Just look for the mud that the termites use to block out the light. Simple. The reflective beans can be clearly seen under dry conditions. If the bait is moist the sun may cause condensation to appear under the window obscuring the view, however this is perfectly normal and means that there are NO termites in the bait. When termites enter the bait they will use the moisture inside the termite tubes to build their mud to block out the light. CONDENSATION = NO TERMITES. What Colour Top Would You Like? Choose from a Natural look; blend in with Dark Green; or highlight the bait with the White plastic inserts provided in every kit. You can even colour-in the 'White insert' to another personalised colour of your choice should you wish to match pavers, tiles, concrete etc. 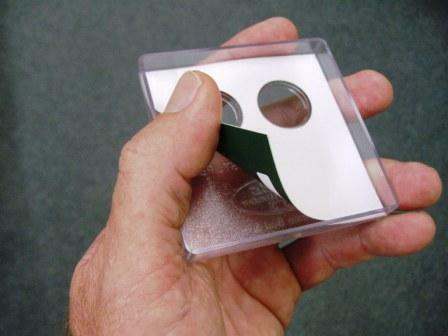 The dual colour optional plastic insert allows for any colour choice. Why the choice of colour? Some baits can be hard to find after a few months among your shrubs in a garden bed, so you may prefer to use the white insert to make them easier to find, but on the other hand you may have some in your lawn and you may want these baits to blend in so you would opt for the dark green choice. Only Green Termite Baits offer you a complete range of colour choices. The special seal inside the top locks out regular garden ants and seals in moisture creating perfect humidity, critical for termites. The top keeps rain out and has slightly raised Ec2c Termite Windows which prevent dirt from building up on the windows. If the bait gets dirty just put the hose on it! The Green Termite Bait System is the only commercially available system that is "ant-resistant". 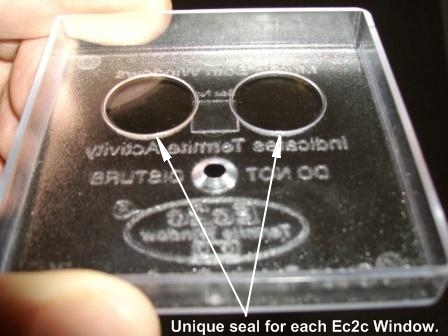 It features a unique internal sealing ring to completely seal it off from other pests. Only termites (white ants) can eat their way in. Hence it is a far superior system than those other 'plastic style baits' that tend to fill up with black ants, brown ants, green ants, spiders, worms, dirt etc. We are emphasizing this point because it is vital. If you are considering purchasing ANY other termite baiting system for your home. A complex plastic bait such as Exterra® or Sentricon® or Nemesis™ will more than likely fill up with regular garden ants. That's a waste of your money because termites will avoid it! Termites will avoid a bait that is full of ants. You need to know this very important fact if you are serious about buying a termite bait system. It is critical to the success of any termite bait system! Why? Because non-targeted pests entering a termite bait will repel termites. You don't want termites diverting around the bait and into your house. The first purpose of a termite bait is to intercept termites. So save your money and don't waste it on any bait that isn't ant-resistant. Beware! Not all bait systems are created equal. The expensive plastic bait on the left is full of black ants. 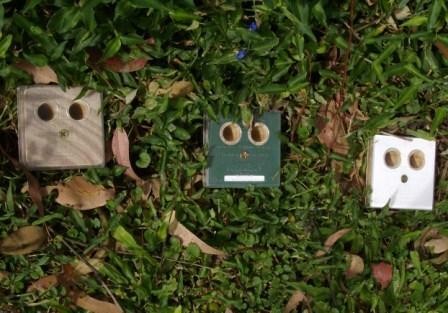 The low cost Green Termite Bait (earlier 2003 model) on the right has intercepted the termites, been treated with termiticide and it is only a matter of time before the nest is dead. Green Termite Baits look great around your home. 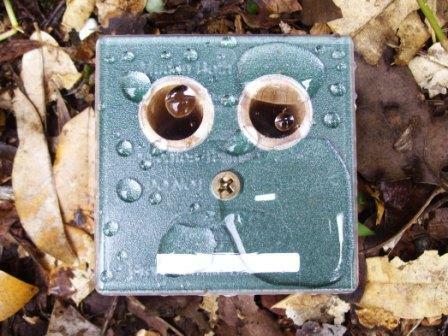 Green Termite Baits look neat and tidy wherever they are installed. Just knock them in and screw on the top. The green or natural colour helps the baits to blend in with your plants or lawn, or if it is covered with foliage, then you might choose the white top instead so you can more easily find it. They are totally safe with your vegetable patch and pose NO health risk whatsoever. They fit flush in the lawn and you can safely mow right over the them. They can go in coarse gravel and blend in nicely. Note: They are actually in the soil under the gravel and the gravel only makes up the top 50cm. Or level in gravel paths so nobody will trip on them. 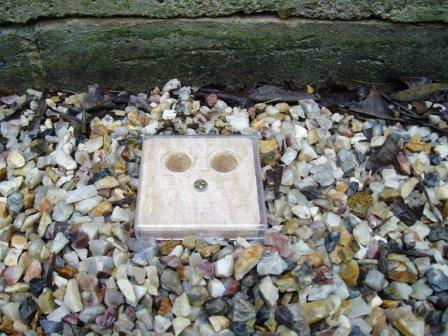 Baits can easily be installed through concrete and made to look very neat and tidy. 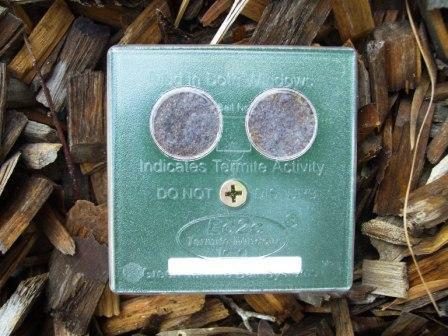 The grey drain cover conceals the bait, yet still allows for easy inspection. Question: Did you know that the Green Termite Bait System improves the value your home when you decide to sell it? It's a big plus in your favour if you have been pro-active in reducing the termite activity around your home. We even provide you with a unique Service History Book which can greatly enhance your property value with prospective buyers. (Available with a Full Service Plan). Click here to see sample book. When you sell your home, make sure you list your Green Termite Bait System as a feature, it will help with the sale and ease the termite fears that are harboured by many purchasers. Fact: Many pre-purchase termite inspections cause sales to fall through or prices to come down. Your Green Termite Bait System should greatly reduce the chances of this happening which means that it should pay for itself many times over. Your bait system not only improves the value of your home when you decide to sell, but it may well save you from expensive termite damage in the present. YOU REAP THE BENEFIT TWICE. This little bait is deceptively simple, but there is a whole lot more to it than meets the eye. In fact, you will benefit from many years of extensive tests and trials to get it "just right". Please remember, it's not just the bait but the whole system that sets it apart. 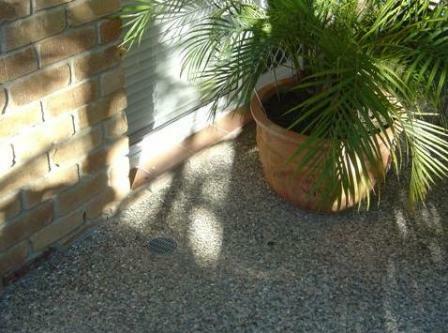 Ant resistant and flood resistant makes it ideal for harsh Australian conditions. It offers the very best value for money especially when it's compared to other commercially available systems. We are the only termite bait manufacturer prepared to offer an iron-clad 30 day fair and conditional money back guarantee. View. Lifetime new for old bait replacement warranty for full service customers or a 1 year new for old bait replacement warranty on D.I.Y baits if the bait is faulty. View. Baits belong to you the customer, unlike some other systems that will reclaim them if you don't keep paying. 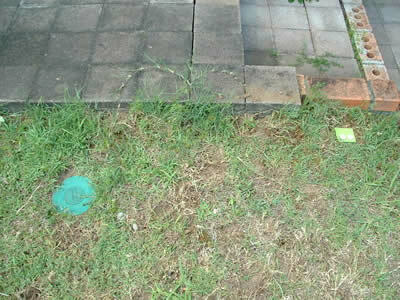 With the Green Termite Bait System you can easily pass it on if you sell your property. It will substantially reduce the risk of termites finding their way into your home undetected. 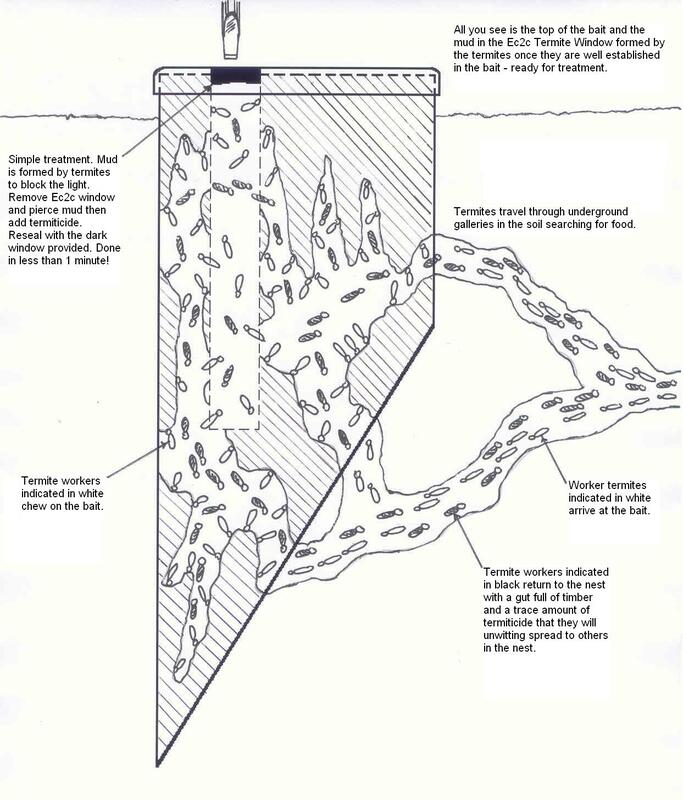 It's the only commercially available Termite Bait System that treats the immediate termite leads (underground tunnels) as well as the bait itself. Gives you a simple and practical way to treat the termites effectively with a range of registered termiticides. Enables you to destroy the termite's home before they reach yours. No moving parts to break, jam or crack after a few months. No awkward lids that get stuck or special keys required to open them. Won't twist in the ground when opening the top - another weakness of Exterra®, Nemesis™ and Sentricon® because when the whole bait twists it tears away from the underground termite leads and scares off the termites, which is the last thing you want when you've gone to so much trouble to gather them into a bait station in the first place. Termites prefer decaying timber. Our baits improve with age, unlike our competitor's plastic bait systems that seize up or crack and break with age. Doesn't allow humidity to escape retaining perfect conditions for termites. Enables treatment of the termites with minimal disturbance in just 30 seconds, once again making them more effective than other baits. Extended treatment times and severe disturbance can render many other bait box and plastic style systems ineffective. Enables you to destroy a termite nest even if it can't be located or is on a neighbouring property. 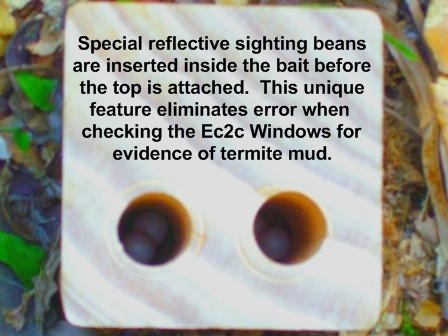 This cleverly designed bait is made from specially selected untreated radiata pine or Tasmanian oak (termites can't resist it), uniquely double drilled to a critical depth which allows effective application of an approved termiticide, and sealed with our Ec2c Termite Window®. No need for trouble prone scanners. 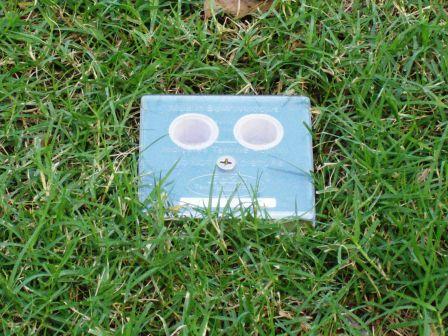 Correctly installed baits do not interfere with lawn mowing. Unlike many other termite baits, we have produced a bait that is large enough to intercept approaching termites (approximately within a 3 metre radius) but small enough not to attract termites from further a-field. Extensive research and numerous trials (since 1996) have proven the Green Termite Bait System to be the best value for money termite baiting system on the market. If you have already received a quote from our competitors you will love our prices. Completely safe for you, your children and your pets. Safe for the environment, deadly to termites. Need more convincing that this is the best system in Australia? Click here to compare termite treatment methods. "The best termite bait system in Australia!" In fact, we offer a $1,000.00 REWARD to anyone who can show us a better "value* for money" commercial termite bait system in Australia! This is not a stunt but a genuine offer - we know we can't be beat. This challenge to our competitors is now 13 years old and still no takers. 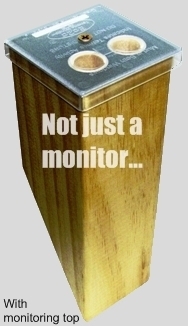 No other termite bait on the market can match our unique design features, so why pay more? * Value is defined as fair price x effectiveness. Challenge what you hear - ask for proof! If perchance, you do hear any ridicule about the Green Termite Bait System, then please tell us (Freecall 1800 6 12345) and give us a chance to answer it fully. We've heard some pretty blatant lies and other nonsense spouted from jealous or ignorant competitors who will say just about any nonsense to make a sale. If you are still undecided about which termite management program is the best for you, we can only admonish you to do a little research before you commit a large sum of money to a system that may turn out to be a waste of money. Put us to the test; we welcome the toughest scrutiny. See our Testimonials (We have hundreds of satisfied customers across Australia). The more you dig, the more you will understand why the Green Termite Bait System truly is such fantastic value. It's true value because Value = Fair price x Effectiveness. When you are ready to save money and protect your home, please contact your nearest distributor. You'll be glad you did. Is all this talk about termites starting to stress you? 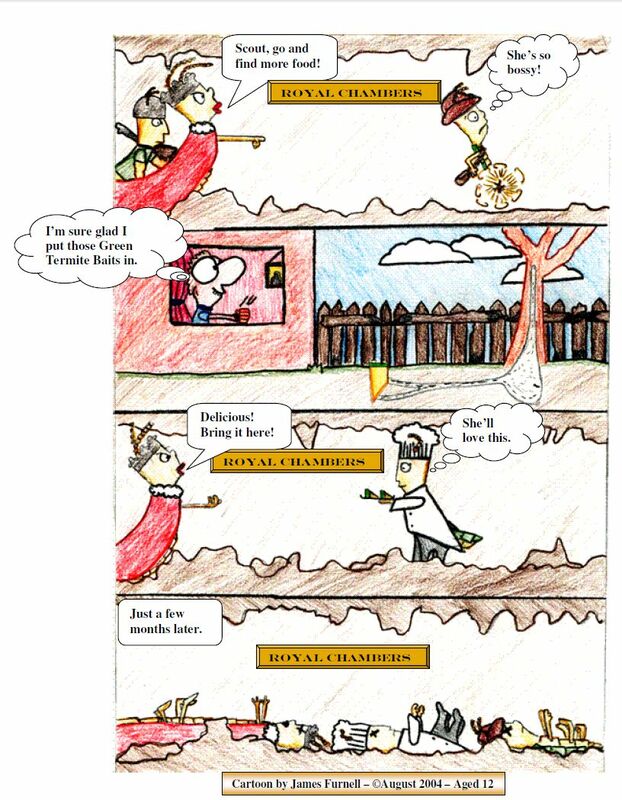 Then relax and check out this fun cartoon drawn by James Furnell. You really can beat termites! Note: Since this was drawn, advances in termiticide dusts mean that control is now only a few weeks, rather than a couple of months previously. Enjoy! How safe is the Green Termite Bait System for the environment? Our baits are made from re-growth radiata pine or Tasmanian oak and a tough UV resistant polycarbonate top which is secured by means of a single screw. They are non-toxic to the environment and the tops are reusable as well as recyclable. The termiticide that we recommend is also very friendly to the environment because we only use extremely low doses that are totally targeted at the termites. There is little if any residual once the operation is completed. It doesn't seem to bother regular ants at all. Safe for worms etc. People and pets etc... Totally safe when used within a Green Termite Bait. The amount of termiticide applied to an active Green Termite Bait is a very small amount. Usually less than 1mL of liquid concentrate or 1 gram of dust. To sum up, starting your car in the morning probably does more harm to the environment. You can check out the MSDS for termiticides and other information by clicking here. Deciding on a solution for your termite problem. Or a chemical soil treatment around your home. Make sure you are fully protected. Both methods mentioned above will usually suit most homes. However, there are some homes that are much better protected by one method over the other. Then there are some other very high risk homes that may be best protected by utilising both methods, or a combination of both methods. Beware of false claims or deceptive wording. If you are going to choose a termite bait system to help protect your home from termites, then make sure that it truly is reliable. Most plastic bait systems FAIL before they start, simply because they fill up with unwanted ants that are repellent to termites or flood during heavy rain driving out the termites. 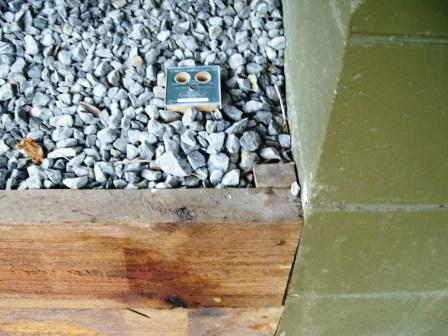 Only the Green Termite Bait System is ant-resistant and flood-proof. If you think an expensive chemical treatment zone all around your house is a good option, think again. Most companies will drill hundreds of ugly holes in your concrete so that the chemical can be applied. Not only can these holes potentially devalue your home when you decide to sell it, but most professionals will tell you that it is not the most reliable way to treat the soil under your concrete. The Australian Standards specifically state that the concrete should be cut and removed so that the soil can be correctly treated. Not only that, but it is usually advisable to replace any unsuitable soil from around the perimeter walls of your home (to the depth of the footings) with a quality soil that can more effectively hold the chemical treatment. If the concrete is drilled and injected, then nobody really knows whether the chemical is effective or not. Sadly, in many cases it fails and termites get the last laugh. It wasn't the chemical that failed. Rather it was the company that failed to carry out the treatment correctly, or failed to advise you that it is more preferable for your concrete to be cut and removed rather than drilled and injected. And of course if it does fail, you won't find out for some time, and when you do, the company that did the treatment will be long gone or else pointing to clauses in the fine print as to why they are not responsible, when in fact they are! Choosing between a good quality bait system such as the Green Termite Bait System or a quality installed chemical treated zone is difficult. Both work well and some homes will need a combination of both methods. Over a five year period, both methods offer similar protection. Green Termite Baits improve with age. Chemical soil treatments wear off and eventually you need to do it all again from scratch. 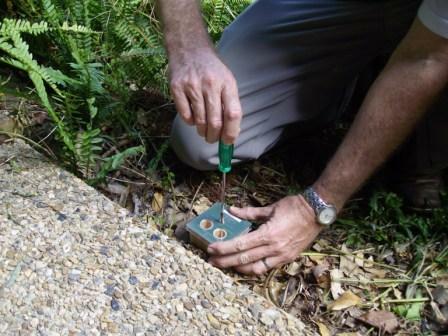 Installing a Green Termite Bait System is quick, painless, and unobtrusive. It's value-adding to your home, and reasonably affordable. On the other hand, installing a chemical soil treatment is pretty messy. Cutting the concrete or drilling holes is no fun; digging up the lawn and garden beds beside your home isn't nice, and the price is usually pretty hard to swallow too. Don't just take our word for it. Prove it for yourself! Get Serious - Don't be a victim of termites; and don't be a victim of unscrupulous Termite Management Companies either. Do your home work and avoid wasting your money and risking your home with inferior products. The termite management industry has its fair share of misinformation, con-artists, rip-off merchants and supposed "professionals" who are not as competent as they would like you to believe. It also has plenty of true professionals. Can you tell the difference? The Green Termite Bait System was developed by professional pest controllers with many years of experience in the industry. Our product has been tested and proven in over a 1,000 homes across Australia with a success rate of better than 99% at intercepting and destroying termites before they reach your home. Don't pay $2,500 - $5,000 for an inferior termite baiting system just because it looks pretty or sounds good or because your local pestie recommended it. Maybe he is more interested in his profits than in protecting your home. And don't be fooled by great sounding warranties that simply aren't worth the paper they are written on - don't just believe us - have your solicitor check out the wording on the warranty. Read the fine print, exclusions and conditions - you'll soon see what we are saying. Disclaimer: Green Termite Bait Systems will substantially reduce the risk of termites gaining entry to your property. This is affected by three factors. 1. The number of baits you choose to install. 2. The available areas for correct placement of baits. 3. The frequency of bait inspections. Monthly checks are recommended. Fortnightly if you are north of the Tropic of Capricorn. However, as with all termite risk reduction systems Green Termite Baits™ cannot and should not be relied upon for 100% protection. Regular annual or bi-annual inspections by your respected termite professional are advised as recommended in the Australian Standards. Additional risk reduction measures may be required in certain cases. No warranty or guarantee against termites is offered or inferred by Green Termite Bait Systems or their authorised distributors. Individual Green Termite Baits do come with a 12 month defect warranty and will be replaced FREE of charge if for any reason they crack, split or become unserviceable during the first 12 months. The life expectancy of a Green Termite Bait is 3-5 years depending on the moisture content of the soil. Unlike plastic bodied systems, Green Termite Baits improve with age. This is because termites prefer decaying timber. Copyright of Green Termite Bait Systems 1996-2015. All rights reserved. The reason for the above disclaimer is simply because the Green Termite Bait System is not a 'stand alone system'. Like all termite baiting systems is needs to be supported by annual inspections as stipulated in the Australian Standards. After the inspection, additional work may be required to make the home safe. This can be best illustrated with a simple example. If you put a termite baiting system around your home, but left a live termite nest in your roof void it would be folly to expect instant results. An inspection would (should) reveal the nest and then an immediate course of action could be taken to destroy the nest, locate and treat their entry point, and then the termite baiting system would be of value by reducing the risk of your home being attacked by termites again. The Green Termite Baiting System should always be used as part of an Integrated Termite Management Program. Head up to the top of this page to find your nearest local distributor for Full Service information and prices. Enter our online shop for D.I.Y information and prices. Remember... Prevention truly is better than cure! The most expensive choice that some folks make is to choose to do nothing at all.